MadgeTech's SMR101A is a soil moisture data logging system, that is ideal for use in irrigation management, green house monitoring and soil moisture trend studies. MadgeTech, Inc., is pleased to announce the release of the SMR101A, a soil moisture data logging system. Soil moisture data is essential in determining and scheduling irrigation for proper plant growth, care and research. The SMR101A provides precision volumetric water content measurements over a complete range from dry to saturated. The data collected can be useful in analyzing the health of the soil and plant root systems. The SMR101A has a 10-year battery life, allowing it to be used for long-term soil moisture analysis, over multiple seasons. The system is ideal for irrigation management, green house monitoring and soil moisture trend studies. The SMR101A features a 4Hz reading rate, a multiple start/stop function, ultra-high speed download capability, 1,000,000 reading storage capacity, optional memory wrap, battery life indicator, optional password protection, and more. 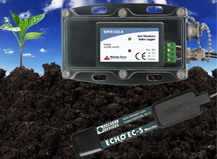 The system comes with an EC-5 soil moisture probe, that has a response time of 10ms, and can be used in all soil types. Using the MadgeTech Software, starting, stopping and downloading from the SMR101A is simple and easy. Data can be displayed in graphical, tabular and summary views and may also be automatically exported to Microsoft Excel® for additional analysis. As the leader in data logger technology, MadgeTech continuously improves its products and develops solutions to meet ever-changing challenges. MadgeTech offers free firmware upgrades for the life of the product so that data loggers already deployed in the field can grow with new technological developments. Units do not need to be returned to the factory for upgrades. The user can do this automatically from any PC. The SMR101A is priced at $299.00 and includes a data logger, water resistant enclosure, and an EC-5 soil moisture probe. For more information on MadgeTech and its products, please visit http://www.madgetech.com or contact info(at)madgetech(dot)com.